Does a treehouse hurt the tree? Ideally not or just a little. A few big screws, well placed, are better than many little screws or nails. Why? Because every wound is a possible entry point for fungi or decay. For bigger constructions better ask an expert to make sure the tree and at the end also your treehouse won’t suffer. The tree grows – is it a threat to the treehouse? If you left enough space between the construction and the tree, the tree will be able to gain in thickness for years to come without compromising your treehouses safety. Especially at suddenly strongly loaded places like for example screws, the tree will grow faster than at other places to compensate for the added load. If it’s too late already and the tree is jeopardizing your construction, you can see if you can support that part of your treehouse in some other way and replace the damaged part. 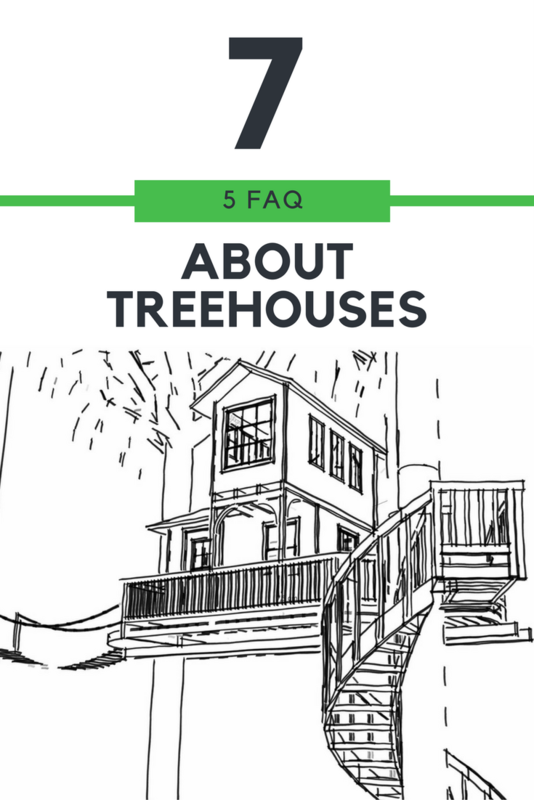 How does a treehouse affect a tree during strong winds? A treehouse adds some extra sail area to a trees canopy. That means the wind won’t blow through it as easy as before anymore. As a result, those parts of the tree which the treehouse is attached to are exposed to a much higher wind load now. The higher you build, the bigger this effect gets. To avoid this you can streamline your treehouse at the windward side by not building a giant vertical wall there. Also solitary trees are more exposed to winds and they’re happy if the added wind load by your treehouse is not too big. How should I maintain my treehouse? Employ constructive wood protection from the very beginning of your building. Use wood suitable for exterior use like Larch, Cedar, Robinia or Oak. Then, when used properly, you won’t have to care about regular maintenance. Some tips: Cover horizontal end-grain surfaces with a board or tar paper. Make sure no puddles can form anywhere and water can run off of every surface. Allow for enough roof overhang so water doesn’t get into the house or the walls ad it stays nice and dry inside. Remove deadwood above your treehouse, it could damage it anytime soon. Sweep off the leaves in fall every now and then so no moisture can gather. The best tip though: use it a lot and it won’t dilapidate! And so won’t you ? 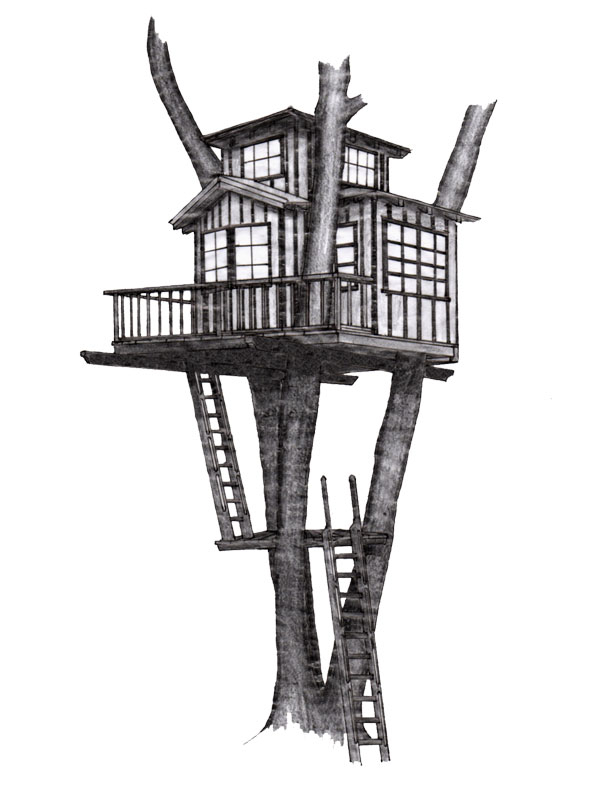 What do I have to consider if I want to build my treehouse on a tree stump? In most cases a stump is not vital anymore and will get rotten more and more every year. By and by it will be a better shelter for worms than for you. Better support your treehouse with stilts from the beginning so you won’t depend on the stability of the stump at any time. Couldn’t find your question? Mail it to us and we’ll put in on our FAQ – list!